♥ Mama 2 Multiples ♥: Key Wonder Review & Giveaway! As a mother of (almost) 4, I am constantly on the go, busy, out and about, and occasionally, losing my mind, among other things. One thing I always can count on losing is my keys! I would either throw them in my purse and then need to dig through an endless mountain of items to find them just to leave the grocery store. Or I'd put them in my coat pocket (that did not zip in y previous coat) and be afraid of losing them. I'd sit them down at home on the counter or table, and the kids would get a hold of them and do God knows what with them! 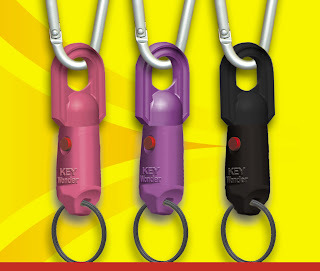 When I was asked to review a new KeyWonder Automatic Key Holder, I was excited! I have to admit, I was a little skeptical of how good this product would work before I received it. I was sent several of these Key Wonders for review. I wasted NO time in trying out mine! I got my keys attached and clipped the Key Wonder to my purse strap, somewhere handy and that I was sure to never lose them! I really was impressed with this product! As you can see from the photo, there are two tiny little buttons to press on each side of the Key Wonder. You push those at the same time, and pull down, and the key wonder comes apart, so you have your keys in your hand for use (driving, unlocking doors, etc.) while the other piece stays clipped to your purse or belt loop or wherever you like to keep your keys handy. The secret? Magnets! There is a magnet on each piece of the Key Wonder, on the inside, that allows them to seamlessly clip together quickly and stay that way unless the two tiny buttons are pressed in together while pulling your keys away. I love that I just press the buttons and pull and my keys are in my hand and every time I stop the van and get out at our destination, I clip the keys back on and they are attached to my purse the rest of my time out, never to get lost in my endless purse again, or fall out of my pocket in a crowded store or doctor's office and get lost. When I am home, my keys stay clipped to my purse there as well, and my purse hangs by our door, so I always know where they are at home too, and can grab them as I rush out the door if I need to! My husband uses a Key Wonder for his work keys, and he took a couple extras to work to give to his co workers to try out, and I have heard nothing but good things from them either! My husband is NOTORIOUS for losing his keys so this is a perfect solution for him! With the busy-ness at his job, it's essential that nobody wastes time losing keys and searching for them, and Key Wonder assures that will never happen again! We also gave our friends a Key Wonder to test out, and they were happy with never losing their keys again as well! All of the skeptism I may have had before getting this product flew out the window after I was able to try it out. I was SOLD instantly and would recommend this product to everyone I know! Key Wonder truly is wondrous! Purchase it: You can purchase a Key Wonder of your very own at their website! WIN IT: TWO lucky readers of Mama 2 Multiples are going to WIN a Key Wonder Automatic Key Holder of their very own! To enter, simply follow the instructions below and fill out the giveaway form!